Torontoist’s 2016 LLWMUL—Aisha Brown, Kaitlin Morrow, Jackie Pirico DeAnne Smith, and Jocelyn Geddie—have all (save for Geddie, busy writing on a TV series) appeared on JFL42 stages this year. Photo by Corbin Smith/Torontoist. It really did seem like JFL42 was going to get through the festival this year without being called out for overtly sexist programming. Headliners Roseanne Barr and Tig Notaro were front and centre in subway advertisements, and more than a quarter of the 42 featured acts the festival derives its name from were female—certainly not gender equity, but a marked improvement from previous years (see #8 on this list). But the problem this year didn’t originate at the top. In addition to the headliners and the “42,” much of the festival’s nightly content is programmed by the participating club venues. At Bad Dog Theatre, for example, their regular improv programming became JFL42-branded for the duration of the festival. 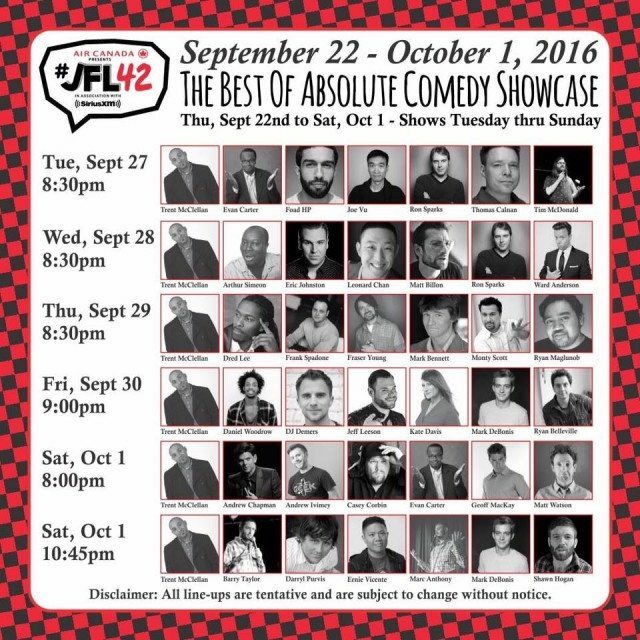 So JFL42 organizers may have been as shocked as everyone else when the Absolute Comedy club, in a boneheaded promotion, released a poster online showing that only one out of 35 slots in the second week of their “Best of Absolute Comedy Showcase” for JFL42 had been allotted to a female comic, inadvertently asking patrons to play “Where’s Waldo?” to find the sole woman in a crowd of male faces. Comic and makeup artist Megan Fraser was the first to question the line-up on Twitter, and soon, many members of Toronto’s comedy community were joining in on Twitter and Facebook to ask how Absolute thought this was remotely acceptable. That part of the statement seems especially telling—that the minimum standard was to have one token female performer per show, rather than to have bills that approached gender balance. In complaining about the scarcity of female comics on Absolute’s active roster, and asking for more female comics to “visit the club more and contact me for spots,” Maglunob inadvertently indicates that the club hasn’t been doing much outreach to find female comics in Toronto. And anyone who says there isn’t a wealth of female comedic talent in Toronto simply isn’t bothering to look. There’s an entire festival devoted to female-created comedy, the She Dot Festival. There are many regular showcases like Natalie Norman and Jess Beaulieu’s Crimson Wave Comedy and Daniela Saioni’s West End Girls, or Zabrina Chevannes’ Things Black Girls Say and Nelu Handa’s Yas Kween, which both focus on racialized female performers. There’s even Torontoist‘s own annual feature Local Ladies Who Make Us Laugh, which is at 30 performers to date. Some stand-ups on Facebook have asked if women are “calling in” to the bookers of the city’s open mics, the traditional gateway to the stand-up comedy circuit. But if all women see are men on those clubs’ bills and the open mic stages, are they going to feel welcome there? A recent Now Magazine feature examined some clubs’ efforts to combat sexual assault in the comedy community—particularly challenging for an industry that congregates mainly in bars, and blurs the line between work and play. 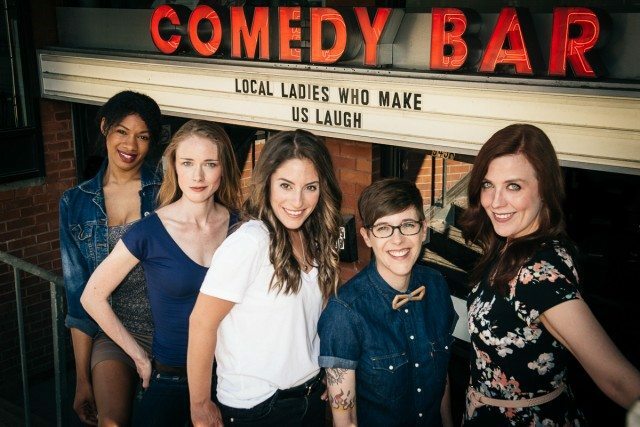 Not surprisingly, the venues that are mentioned—Second City Toronto, whose current mainstage revue cast is gender balanced, and Bad Dog and Comedy Bar, who’ve set up an anonymous harassment reporting system—are the ones that aren’t having issues attracting talented female comedy creators and performers. It’s simply ignorant at this point to suggest that the reason comedy bills don’t feature more women is that there aren’t enough talented women to go around. It’s up to the clubs and their agents to scout and book with an eye for diversity. Ian Atlas of Empire Comedy, for instance, this year has brought more out-of-town female performers into Toronto than male, in an attempt to cultivate a fan base for their emerging talent. Bad Dog has hired an inclusion director, and recently announced relevant scholarships. Clubs that aren’t making an effort to encourage and welcome women, as well as racialized, LGBTQ+, and differentially abled performers, risk becoming irrelevant. More than anything, comedy’s primary currency is relevancy. That’s something JFL42 would do well to stress to its partner clubs for future programming.